Like always, kids grow up, making us thinking they have nothing else to do (and play). Even when we’re trying really hard to keep them small, it doen’t stop them from growing up and Oscar is quite a good example ! It is long gone the time when I had a small infant hugging in my arms. Oscar is a small, Wait ! 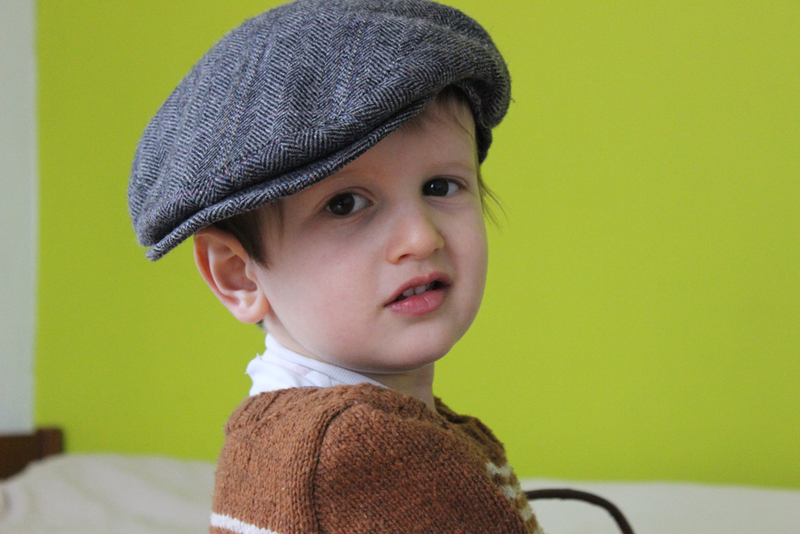 A BIG 2-years-old boy and 3-years-old clothes don”t fit him anymore (let’s not talk about the last pullovers I knitted him, in size 2…). As an unworthy mum, I tried to make the size-2 pullovers last longrs, but there was not enought pulling on the sleeves… Early January, I resigned myself to knit a size 4 new pullover and I dove right in my knitting queue to find the perfect pattern for Oscar. I didn’t hesitate for long, because I’ve loved the Emmitouflage(s) collection from Nadia and Solenn since they published it. The pullover Softly (you) is particularly charming, and Pilou liking it too, choice was made ! For yarn choice, I met no issues, because I love Ulysse. But it was much more difficult to choose the colourways. After really long talks, considerations and hesitations, 3 Caramel and 1 Poivre Blanc yarn balls were in my shopping basket (among other lovely yarns I brought that day). The only problem ? Oscar never wanted to try it on !!! So, I tried something to make him accept this new pullover. I decided to knit one mini Softly (you) for his doll, with a little hat. But it didn’t change a thing ! Neither Oscar nnor his baby would try it on… You can guess my sad sad face ! Adn then, one day, two months later, after numerous fruitless tries, out of nowhere, Oscar accepted his new pullover and it became his favorites… Which is good, because he haven’t another one who fit him ! Better thing ? Baby doesn’t want to leave his pullover and hat either ! I had noted what I did to make the mini Softly (you), unfortunately, I lost my notes… I’m sorry !